Today my classroom is in chaos! There is a pesky little Leprechaun flitting around the school. 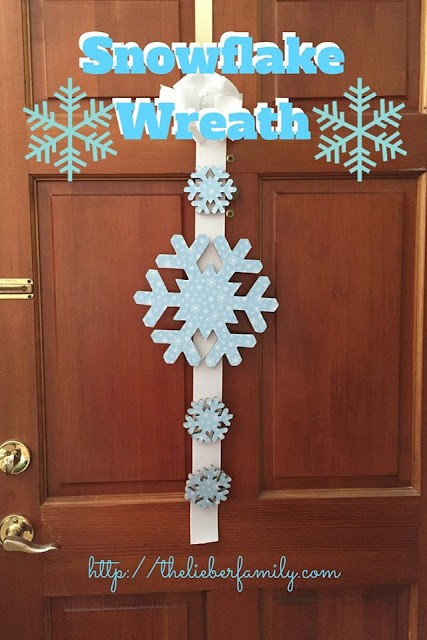 He dumped out the two and three year olds' toys and left sticky green footprints all over their rooms. He left piles of glitter on my tables and dumped out some of my toys too. 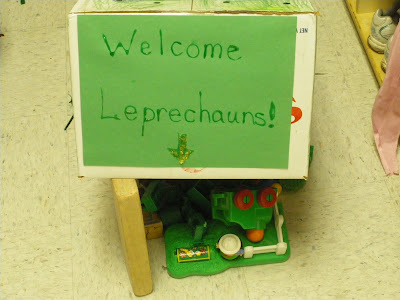 The kids found a box in the class room and decided to make a Leprechaun trap. They colored the box green and decorated it with green items from the art cabinet. Then we set the trap. We put it in the cubbies because that is where it is quietest. The kids filled the "house" (we have to call it a house, or he might not come) with all the green toys they could find and then went off to their mats for nap time. They know that the Leprechaun won't even go looking for his new house if they are awake...or even if he thinks they are awake! The cool thing about this scenario, is that the kids came up with the trap idea by themselves and they worked together to make it and set it. I tossed in the bit about having to go to sleep-they don't naturally go to sleep very well on their own. And they did all fall asleep!! I took out all their green toys and left them some gold coins (that look suspiciously like pennies) and some green pixi sticks. I also left them a note from the Leprechaun thanking them for the house, but telling them that he was headed back to Ireland.